But, we did have a glut of oranges and with no other ideas for how to use them up, marmalade it was. I was thinking edible Christmas presents as the plan this year is to make a hamper for everyone with homemade treats, credit crunch presents if you will. Preserve making is tricky, I won’t lie, a whole other skill apart from cooking with, it seems, complex rules that I don’t even know or understand yet. 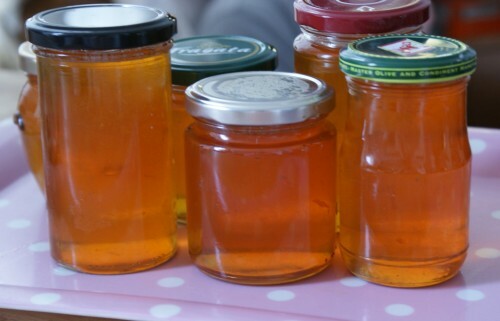 Thankfully, I made A LOT of marmalade whilst working at Pieceofplenty and learnt an awful lot there, so today wasn’t too stressful but it did cover everything in the kitchen with sticky orange goo. 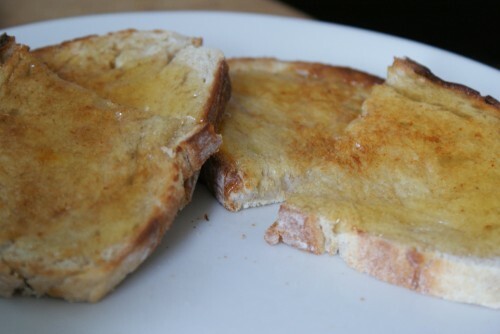 Judging by the fact that a certain someone has already had several slices of toast slathered in the stuff, I reckon it was a success! First sterilise the jars, wash in soapy water, rinse well and then place in a cool oven, 130C – for 15-20 minutes. Wash the oranges and place in your largest saucepan. Cover with the water and boil for 1½ hours. 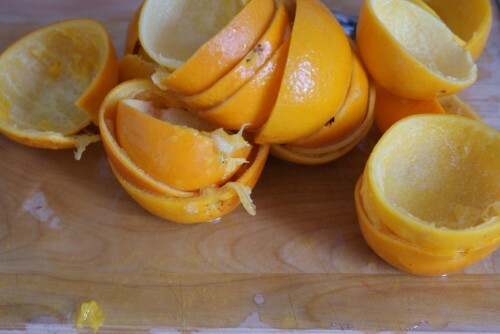 You can do this the day before and leave the oranges, covered on the stove. Once cool, remove the oranges. Cut each in ½, scoop out all the flesh and add back to the pan, pips and all. Cut the lemons in ½, squeeze the juice into the pan and toss in the lemon too. Boil rapidly for 20mins uncovered until reduced by half. If you like smooth marmalade, discard the oranges. But if you like it chunky, and I think it looks nicer, slice the skin into thin strips. Once reduced, sieve the liquid and return back to the pan. Tip in the orange skin (if using) and sugar. Place a saucer into the fridge. Bring to a vigorous rolling boil, stirring to dissolve the sugar. Boil uncovered for 5mins. Now, here is the tricky bit, you need to test the marmalade to make sure it will set once cooled. Spoon a teaspoonful of marmalade onto the saucer. Allow it to cool for a minute back in the fridge, then push it with your little finger – if a crinkly skin forms, it has reached setting point. If not, continue cooking and do more testing at 15-minute intervals. Once ready, allow to cool for about 30mins so that the skin is dispersed evenly and ladle into the jars.